In this area, you have the option to add customised personal car mileage Rates (per mile) or apply additional settings to existing personal car mileage Rates. You cannot Edit or change the Rate (per mile) for an existing personal car mileage Rate. You will need to delete any Rates (per mile) which are no longer required and create a New Mileage Rate (per mile). 1. From Admin, click Mileage and Fuel Rates. 2. 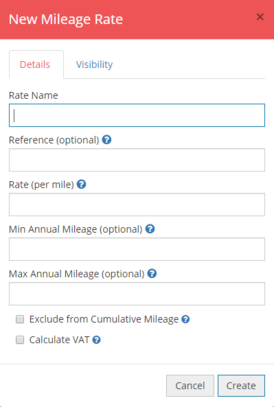 If you want to edit existing mileage rates click Edit next to the mileage rate. Please note: All the information except the mileage rate can be changed. 3. You can customise the name of the mileage rate. 4. The Reference field allows you to add a reference or code which you can use if you want to map this mileage rate to your accounting package. 5. You can set a minimum annual distance limit for this rate in Min Annual Mileage. 6. You can set a max annual mileage rate limit for this rate in Max Annual Mileage. Please note: Mileage assigned to any mileage rate counts towards the distance limits unless Exclude from Cumulative Mileage is ticked. This can be useful to exclude passenger and bicycle rates. 7. If you would like to claim back the VAT on your mileage claims tick Calculate VAT. Please note: In order to calculate the VAT on the mileage claims, you will also have to populate the vehicle details section with the appropriate VAT rates for your fuel rates. 8. Navigate to the Visibility tab. 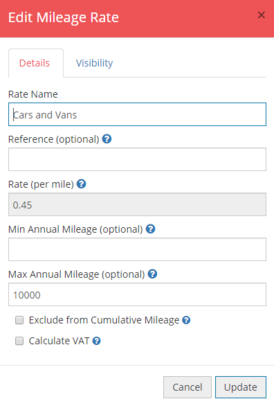 Here you can decide which of your users, departments or user groups are able to access this mileage rate on their expense form. Once you're happy, click Update. If you would like to add a new Mileage Rate, click the New Mileage Rate button, populate with the new details and click Create. Customise the fuel rates used to calculate VAT on personal car mileage and to determine the rates for company cars.